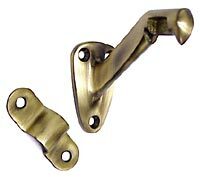 These solid brass handrail brackets are of the finest quality available today, just holding them in your hand makes you fully appreciate the weight and quality. Packed in individual poly bag with matching screws. Note: This product is also known as HRB325U5, DEL-81366 on other websites. Projection to Center of Rail 2-5/8"